Got some new SU toys! 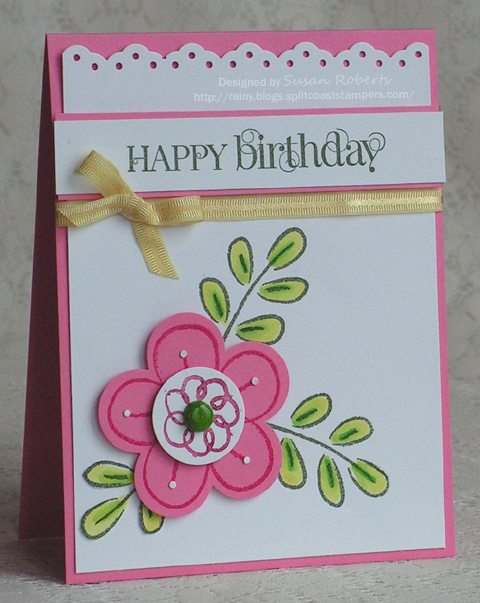 Here is a card made with the “Flower Fest” set. SO much fun! The flower center’s brad was colored with the darkest Copic used on the leaves. Makes for a pretty good match! Sigh. When will I learn?!? But whatever. I’ve got more new toys to play with, so life is good! Ha! 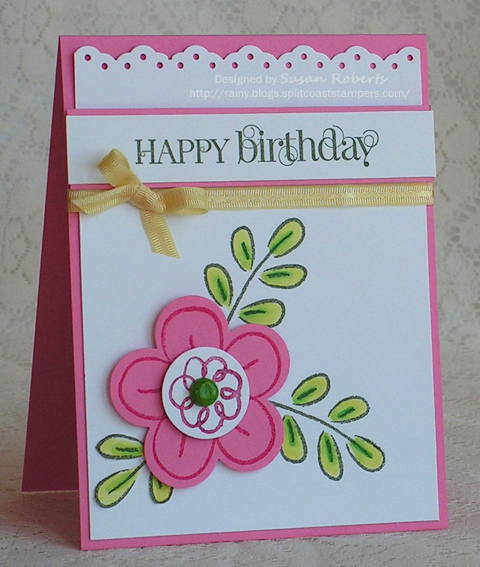 I am always thinking I need to add a “little something else” to my cards…but my style is really pretty CAS. Although it is fun to get carried away sometimes, the cards that make me catch my breath the most are almost always simple…those are hard to make! This is a lovely card and not fussy at all! Love how you added the ribbon nudged right up to the sentiment like that! Susan this card is right up my alley! I love the bright colors and the white space. I’m glad you’re using some SU stuff again. TFS. Wow, Susan, this is a beauty. Love the crisp, clean look and your colors are fabulous. Really pretty and I like the little white dots! Clever. I too am more pleased when I create a C&S card, but I still get into my layering and adding just a tad bit more mode as well! This is cute with those little white dots – I like them! This card is a perfect example of layered CAS. 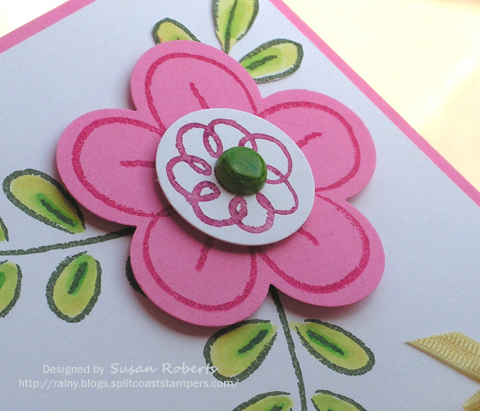 I love the fresh fun look of pink, white and green. CAS should be easy but it’s not! I love your take on the style. Maybe you should call it CAS+! That is frustrating when you’re just sure it needs something…and then you wish you hadn’t done it. I like the card tho! happy and fun! so cute, I too have trouble with stopping myself from putting too much on a card. Love the font style on the sentiment! Love the fresh clean look, Susan! That pink really pops your design. I love how cute and sweet and simple this is! The style really appeals to me, and any single solid color with white is my current favorite. This is just like candy to me!